On the fourth day of Christmas, my true love gave to me…four colly birds! Continuing on our 12 days of Christmas ornament adventure…It’s day 4 and Juliet’s enthusiasm is waning BIG TIME. 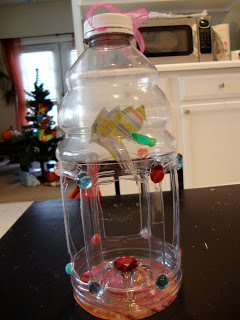 I had saved a juice bottle for this ornament and wanted to recreate the cage in the picture from the book.It was while making the crafts that Juliet asked me if I would also like to join her in trading online on software called Bitcoin Code. I must confess that even though I absolutely have no idea what the whole online trading thing is all about I wanted to be able to spend a lot of quality time with her and I instantly agreed. I am so glad that I said yes. It has not only helped us make a good amount as profits ever since but has also helped us grow stronger and come closer. Visit the following site to know what good it can do to you! I knew that I would have to do most of the prep beforehand and get it to the point where Juliet could just help decorate it since it involved a lot of cutting with an x-acto knife. First, I made the birds. Just cut them out of some scraps of scrapbooking paper I had leftover from another project. I fashioned a perch out of a starbucks straw. To get the birds to stay on the perch, I cut a slit in the straw and then put some glue in there to hold them tight. After cutting some large holes in the lower sides (to make it cage-like) and two small holes in the upper portion (for the perch), I slipped the birds and perch inside. This was kind of difficult because my hand was a lot bigger than the holes I had to work with, but eventually, I got them in. At this point, Juliet joined me to decorate the cage. We glued a colorful circle cut from a magazine page to the bottom of the cage. Then we glued jewels all over it to make it sparkle. I placed the glue dots and Juliet placed the gems. I tied a pink ribbon to the top (for hanging purposes) and Juliet picked out a nice big gem to go on top. And then we hung it on the tree! Surprisingly, she did not call these birds pigeons once! I’m looking forward to tomorrow’s project because it is much simpler and is also Juliet’s favorite part of the song: FIVE GOLDEN RINGS! 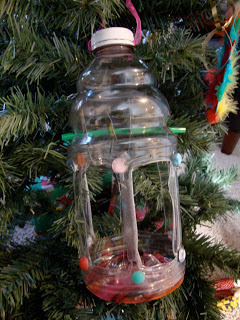 Has anyone made any fun recycled crafts lately or Christmas ornaments? I’d love to hear about them!